If you are someone who loves waffles, you would know that finding good waffles can be difficult. In fact, making good waffles is no small feat. There has been so much talk and review on what determines good or bad waffles. Many people place so much emphasis on the batter, but that is not always the deal maker or the deal breaker. Good waffle bakers knows that good or bad waffles can also be determined by the quality of the waffle maker used in baking it. The main challenge now is choosing the best waffle maker for your needs. What’s a Breville Waffle Maker? There are several shapes, brands and sizes of waffle makers, all with a wide price range. It is worth noting that a waffle maker which has a low cost does not translate to poor quality. Also, the fact that a waffle maker is expensive does not automatically make it excellent. in fact, it could all be because of its brand name. Besides price, there are also several other factors to consider when looking to purchase a waffle maker. You have to be sure that your waffle maker can last you a long time without a hitch. The maintenance and design specifications of a waffle maker should also be taken into consideration. One brand that has been at the forefront of the waffle makers’ race is Breville. This electric kitchen appliances brand originated from Australia in 1932. Breville has since evolved into a global brand name that trades in over 30 countries. There are several types of Breville waffle makers, and one notable one is Breville BWM620XL The Smart 2 Slice Waffle Maker. In this article, we’ll review this waffle maker. We will provide you with more than enough information to determine if this is the perfect waffle for you. 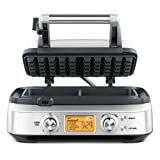 Breville BWM620XL The Smart 2 Slice Waffle Maker has several innovative features that has given it pedigree among waffle makers. This waffle maker has dimensions of 15″ x 12″ x 5″ and weighs about 5.4 lbs. The waffle maker is made of an exterior stainless steel housing that gives it a glossy finish. The baking plates of this Breville waffle maker are made of cast aluminum and can easily carry and properly distribute heat. This waffle maker can make two slices of waffles at once. The Breville BWM620XL Waffle Maker has the state-of-the-art Breville waffle IQ system. This innovative feature by Breville automatically calculates the baking time of your waffle to suit your specified preferences. This takes away the stress of calculating the baking time to in regular waffle makers. The automation in this waffle maker does not stop there, as this waffle maker has five batter type settings that you can choose from. There are four custom made batter type – Classic, Belgian, Buttermilk and Chocolate. If you do not like anyone of these types, the fifth option allows you custom your batter to your taste. The Breville BWM620XL has 12 different color/browing options. You can select any one of these options depending on the color you would love your waffles to be. The cooking plates of Breville BWM620XL The Smart 2 Slice Waffle Maker possess thermally engineered heating elements. This feature doesn’t allow waffles to be undercooked, ensuring there is even distribution of heat to every part of the waffle. The cooking plates also produce fluffier waffles because of its deep and thick design. Breville has also solved the problem of messy cooking plates with its innovative wrap-around moat that catches and bakes any batter that is overflowing. This waffle maker also has a non-stick surface, which is PFOA and Teflon free, which prevents your waffles from sticking. All of these ensure that the waffle maker is easy to clean and maintain, and also safe! Once the top lid of Breville BWM620XL The Smart 2 Slice Waffle Maker is closed, the timer starts automatically. There are two buttons on this waffle maker. The first one has an LCD indicator and is used to reset the timer of the waffle maker. The second one is used to add extra time to an already baking waffles. This means that if you want your waffle browning to be darker than it already is, you can just add extra baking time without having to reset the timer. Another wonderful feature of this waffle maker is the elimination of waiting time between removing cooked waffles and adding new batter. This is made possible by the absence of preheating time. This feature is especially important if you run a waffles business and have several customers to attend to, or in other words, have a big family to feed! Several customers have given reviews about the Breville BWM620XL. This waffle maker has an average rating of 4.4/5 stars from over 60 customer reviews. There are some products that can be compared to Breville BWM620XL. Two such products are Breville BWM640XL The Smart 4-Slice Waffle Maker and the Cuisinart WAF-300 Belgian Waffle Maker with Pancake Plates. Breville BWM640XL The Smart 4-Slice Waffle Maker is very similar to Breville BWM620XL The Smart 2 Slice Waffle Maker as they have almost the same features. The major difference lies in the number of slices of waffles that they can each take. Breville BWM640XL The Smart 4-Slice Waffle Maker also costs $35 more than Breville BWM620XL The Smart 2 Slice Waffle Maker. The Cuisinart WAF-300 Belgian Waffle Maker with Pancake Plates is another worthy rival of the Breville. The Cuisinart waffle maker also makes Belgian waffles and costs over $100 less than the Breville waffle maker. In addition to waffles, though, the Cuisinart also comes with pancake plates! Q – Do the grids come out for cleaning? A – No, the grids do not come out for cleaning. However, the design of this waffle is such that there is no mess, so you just need to wipe the grids to clean up. 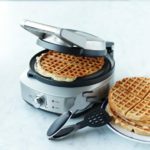 Q – Can this product make any type of waffle? A – This waffle maker bakes Belgian style waffles. For more information on the difference, read this article. Q – Does it have a warranty? A – Yes, it has a one year warranty. Whichever way you look at it, Breville BWM620XL The Smart 2 Slice Waffle Maker is a great product. When you consider its numerous technical and design features, you will realize you have quite an appliance on your hands. If you are looking for something less pricey, then consider the Cuisinart product we spoke of earlier, both are great appliances. Also, if you are going to be feeding several mouths, then the four slice Breville waffle maker might work better for you. If you are undecided, let me know how I can help you make your decision!